I read a news article discussing the growing “no-show” trend in the restaurant industry. Are you familiar with the term “no-show”? No shows are customers who make reservations or appointments and then don’t show up for them. No-show diners are bad news for any restaurant owners. The consequences can be dire when they’re in large parties. 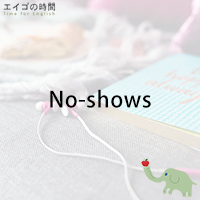 Some estimates say no-shows and last-minute cancellations cost 200 billion yen annually in lost revenue and wasted food. The article features a new solution introduced by a credit card company to deal with this age-old problem by using LINE, which is a popular messaging app. Well. I’m sure technology can help, but so can just a single phone call. After all, no-shows mean no manners. What do you think? 1. No-show customers don’t show up for their reservations. 2. No-show customers show up late for their reservations. 3. No-shows are a new problem caused by technology. Next Post 来なかった – He didn’t show up!